This Homemade Tick Spray recipe contains a natural tick repellent that works so well at repelling ticks! I’ve been using Rose Geranium Essential Oil from the advice of my holistic vet as a natural tick repellent for the last 3 years (update 4/2019 — 6 years!). And it’s kept my family and my dog completely tick free in those years! Which is kind of a huge deal because we live in the woods of Pennsylvania. Before I discovered Rose Geranium essential oil I was pulling a minimum of 3-4 ticks off my dog each day – Yikes! 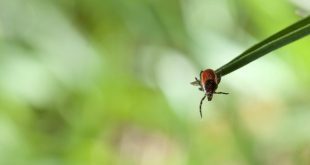 In my original natural tick repellent blog post, I told my story about our tick problem and my discovery of rose geranium essential oil. And many people asked me if they could make a natural tick spray out of Rose Geranium. If you can’t see the video player above, CLICK HERE to watch the video on YouTube! 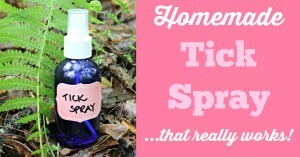 Homemade Tick Spray using Rose Geranium Essential Oil. Natural Tick Repellent that has been working for us for the past 3 years! Mix the vodka or witch hazel with your essential oil in a spray bottle (I use THIS glass spray bottle). Pour in your distilled water and shake, shake, shake! Spray on your clothes and/or your skin. You can even spray it on your dog or horse to keep them tick free! This is awesome! I just got my goodies from Mountain Rose Herbs to make your flea/tick powder from another post! Can I use regular DTE for that, or does it absolutely have to be food grade? As for your tick spray, I have regular geranium oil. Is that the same thing as Rose Geranium oil? So cool 🙂 Can you send me a link to the DE that you purchased? If it’s from Mountain Rose Herbs, it’s most likely fine, but it is really important for it to be food grade – the other stuff can really irritate and harm the lungs and respiratory system due to the way it’s processed. I just want to make sure you’re safe! I have heard some people having good luck with regular geranium essential oil for ticks. Rose Geranium, which is different than Geranium is what was recommended to me by my Holistic Vet, as well as what’s recommended in a lot of holistic pet care books. It’s the only one I have personal experience with. But I have heard of some success with geranium, too. You could always try it! Keep me posted if you do! Yes, the second one is the one you want, Tess! How often should I spray on my puppy? Hi Lauren, I spray every time my dog goes outside! hi kelly, i thought in posts from a few years back, you used straight up rose geranium in between shoulder blade and on base of dog’s tail. Is that not the case, do I need to make the spray as a safety precaution? I still do that, Cecilia! Since that post, I got so many people asking for a diluted tick spray option, so I made one 🙂 But I still personally use the rose geranium drops on both me and my dog and have done so for about 5-6 years now (still having great success with it, too!). The spray recipe would definitely be a better option for kids and perhaps people (or pets) who are more sensitive to stronger smells. Because the spray is diluted, I found that it has to be reapplied a lot more often to be as effective. Have a great summer! Thanks! I see you say you spray your dog everytime he goes outside. So, I was confused on whether you sprayed or used straight up oil? Please clarify? Do you do both? I just do the drops! I did use the spray on me, my husband and dog for one whole spring/summer season just to make sure it worked before I posted it. It worked well as long as I kept reapplying it throughout the day, which was a pain for us, to be honest. We are outside the vast majority of the day during the spring and summer, so the drops have been much more practical for us! Hope that clears things up. Yes, thanks so much. The drops would be better for us! We started using Rose Geranium Oil as a tick repellant. Until now we would literally pick 4-7 large ticks of the walls every morning from our 3 large dogs. We live in Texas and it gets rather hot during the summer here. It has worked great, our dogs are happier and can I tell you my wife and I are much happier. So great to hear, Doug! We vacation in upstate New York (about an hour above Watertown, not far from the Canadian border) every summer. Love that area! Great job! Will definitely be making some for our summer vacation..Are there any cosmetic uses for rose geranium? Thanks, Kathy! Yes, Rose Geranium is especially good for balancing the skin. It’s also great for assisting in the healing process, which is nice if you have cuts or burns, etc. I’ve heard a lot of people using it to help with PMS and anxiety, too (it’s known to be an awesome balancer so it helps balance skin, hormones, nervous system, etc.) You can just mix a drop in your daily dose of moisturizer or favorite oil for your skin. You can also add a few drops to an epsom salt bath to help with hormones and anxiety. Have a great vacation!! Hi Kelly! You are so wonderful to respond so quickly!! Thinking about what you said, I may need to hunt around some more for food grade! So it seems like there’s some conflicting info in the description, which makes it confusing! It says it’s made from natural Silicon Dioxide, coming from a freshwater source, which is what we want. But it says down in the description box that it’s not safe to ingest or use for pets. But then further down, it says you can use it for pets. Confusing! If it were me, I’d try to locate one that I knew for sure was food grade and safe for pets. Food grade DE is safe for animals and humans. Lots of uses..
Hi Kelly thanks for the info, could you please let me know if it would be suitable to our beautiful kitty as I am aware essential oils are not normally used on kitties. If this is not cool for Rosie (our kitty) do you have any ideas what I could use instead. 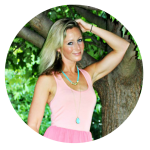 I’ll tell you what I know based on holistic vets and essential oil experts I’ve talked to. The advice is completely split down the middle! The issue is that cats lack a certain enzyme required to metabolize ingredients they don’t recognize. And as of now, there’s not a whole lot of conclusive research on cats and essential oils. So the conservative essential oil experts all say don’t use essential oils on cats until there’s more research done. And then the other half of the folks, including all the holistic vets and animal practitioners I talked with, say they’ve been using rose geranium and certain other essential oils on cats for decades in their practice with great success and recommend it daily as a tick repellent to their patients. My Vet and all the holistic vets I’ve talked with are completely ok with using Rose Geranium like this spray on cats. Hope that helps! I love the name Rosie for a kitty! So sweet! Great video Kelly! You are just so stinkin cute and gorgeous and I’m glad you decided to do some for us! Im wondering if the witch hazel has to have alcohol because I only have the non alcohol with aloe? Thank you, Kari!! 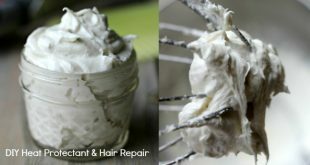 <3 Your witch hazel is perfect to use for this! Oh good Kelly! Keep the video’s coming :0) Don’t feel vulnerable…you are safe with us girl! (((((hugs)))) Love the great inspiration you give us, its very much appreciated. LOVED the video and tips! You are adorable! 😀 I’ll definitely be trying this on my two dogs and us as well since we are an outdoor family too! Thanks! 🙂 Keep the videos coming! Freda, I have a large dog, too – 110 pounds and when using the straight / undiluted rose geranium oil, we do a drop at the base of his tail and a drop in between his shoulder blades 🙂 We’re still seeing excellent results and it’s been about 5 – 6 years now! Hi Lorelei! Thank you for your sweet words!! I have been using mostly all (with the exception of eye liner) 100% Pure Makeup for the past few years. I love it – such great ingredients and a nice, high quality makeup. HERE is the link to the blush I’m wearing from their site. When I first got it, it was SO bright (like a super bright pink – like the picture but a little more vibrant in person) and I was used to wearing softer colors. But I tried it and it was perfect. 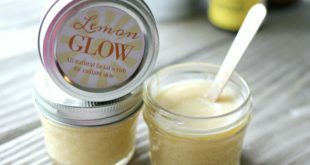 I’ve been buying that color ever since 🙂 And you’ve got to try the homemade coffee scrub – I swear by it! I did it right before the video! Great to watch and hear you “live”. You have nothing to worry about – gorgeous girl. And your enthusiasm is infectious. I was just telling a friend about your earlier flea/tick help. Her old computer doesn’t do video, so I’m not sure if your videos will include transcripts (or abbreviated transcripts) for those times the internet goes down. Thanks for keeping us all informed and healthy! Janet! Thank you! Your words always mean a lot to me. I am not really good at technical stuff, but I will look into what I need to do to get transcripts or something similar! Fun video, Kelly. Thanks! You sold me before on rose geranium oil and now I can make a spray. Love it! Thank you, Vicki! Hope you like the spray! Oh thank you this is awesome!, thank you! Do you think it would work for chiggers, too? I don’t have experience with chiggers, but it seems to repel most bugs (we’ve found it especially effective on ticks and mosquitos!). 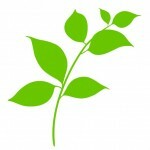 I’d love to hear if anyone out there has any personal experience with a natural chigger remedy! Thank you for the helpful info. Do you have or know of a natural fly repellent remedy for dogs? We live in the country on a farm and have black lab who is always outdoors. The flies are so nasty to her. Quick question here.i want to make the spray,but wanted to know. What do you use on your dog? The spray or you put the oil directly daily? Wich one works best? Do you reapply when it starts to dissipate? I mixed mine with coconut oil and i apply it with a dropper on my dogs from neck to backend like a Spot On and then brush it. Ticks are out of hand this season and poisons *eww* are not working. i got fed up and changed to the geranium oil today. lets cross our fingers. i will update later! Its the same brand you used,i also made the spray. Thank you for giving an alternative to the Frontline I have been using on my dogs for years. I have seen a correlation between the Frontline that I give my Westie to the fact that he gets his Nystagmus a day after it has been applied. I have been reluctant to give him the Tick Repellent for the past 6 months so I haven’t been giving him anything. I am waiting for the Rose Geranium to arrive in the mail (ordered it this past week). I am not that diligent when it comes to spraying anything when I let the dogs out. 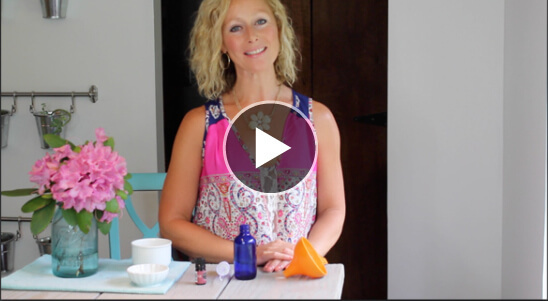 . . but you stated that you’ve been using 1-2 drops of straight rose geranium on my dog’s backend when we’re outside for long periods of time.” How long does this last? Is it like Frontline that last a month or do I need to apply it daily when we hang out in the backyard? Thank you for your response. Hi Pam! The 1-2 drops lasts all day for us! I do have to remember to put it on everyday, though. Dina, with young kids, I would recommend diluting it with an oil. That lasts a lot longer than the spray – that will most likely last all day. I would do 1-2 drops in a teaspoon of oil (olive oil, coconut oil, etc.) and then just rub it on their arms and/or legs. If you wanted to use the undiluted oil, just put a drop or two on their clothes (not on the skin). Hope that helps! Hi – how important is it for the water to be distilled? Can we use purified or tap? Hi Morgan! You can use purified or tap, but just boil it for a few minutes first and then let it cool down. Boiling it will get rid of any bad bacteria. I’m not sure if this is the ingredient people are complaining about on commercial all natural tick repellents but I figured I’d ask you. does this attract bees? I’ve read reports on a few commercial brands with some essential oil that it worked with the ticks but the bees came out in droves negating it’s safety. Hi Kathy! We haven’t had a problem with bees in the 3 years we’ve been using it. So far, I haven’t received any bee complaints from readers, but I’d love to hear if anyone else has noticed a bee issue. Thank you for bringing it up! does it work on fleas? Hi Stephanie! Some of my readers swear it works on fleas and have told me that ever since they’ve been using it, they haven’t had any tick OR flea issues. But I had a different experience when we moved into a flea infested house. It didn’t work for our infestation. I just adopted a cute 3mon old puppy. She is only 5 pounds. She will get about 10. Part yorkie/Shitzu. Already pulled 3 crawling ticks off her and myself! ! Yuck! Cant wait to try your spray. Is she too young to use this spray? Hi there good video re tick repellant. I will share and want to make it now but do not have cup measurement…how many tablespoons would be in one third cup please? Hi Julia, There’s 5 tablespoons + 1 teaspoon in 1 cup. Good morning Kelly, When using the full strength drops do you need to put it on ahead of time so it spreads to all the skin surface? I think I found the purpose of the vodka in the spray. If you do find a tick on your critter, drink a couple of shots of the spray. The rose geranium oil will calm the nerves and the vodka will make you silly enough to not care as the tick is pulled off. Have a great rest of the day. hahahaha! I like your explanation 🙂 I have my bottle of rose geranium essential oil on a side table right beside my door. Right before I go out, I put it on. I haven’t needed to do it ahead of time. Glad I got a giggle out of you. Got a small bottle of RGO on order. My dog loves to roll in the grass so I hope this works. Have you ever had an issue with ear mites? What would you use for those buggers? My daughter told me about this and I’m going to try it. We pulled 5 ticks off my boxer yesterday so I went to our local natural store and got the rose geranium oil. Applied it to my dogs (I also have my daughter’s pomeranian with us). So far, so good. The ladies at the store also gave me a recipe to make a spray using this oil along with citronella and lemongrass, but I’m going to try this first to see how it works. Fingers crossed that this is what we need. Does this spray work on fleas too? Hi Hayley, it does help repel fleas and other bugs like mosquitoes, too! Hi there. Thank you for the great information. I just moved to DE from the west coast, so ticks are new to me. I have a pet rabbit that I would like to bring out into the yard for some sunshine playtime, but since my yard is filled with trees, and I assume, ticks, I’m wary. Rabbits can be more sensitive to EO than other animals. Do you know if this would be safe to use on him? Thank you for this recipe! I cannot wait to try it! My lovely Pippa dog recently was victim to a vicious tick! It was my fault, because I forgot her spot on liquid :(! I am going to try this asap. We have been searching for a property in the woods and since then have been coming home with ticks on us. I hate them as much, if not more than you do! My husband seems to be the one they like to bite. Probably because he is the one who goes the deepest into the woods. My daughter and I just find them crawling on us and remove them. That is still yucky and kinda creepy. We spend days thinking we have them crawling on us. I sure hope this works. We have tried many organic and natural repellants but none have really worked. Did you know that rose geranium also repels mosquitoes. It does, I know for a fact. We lived in Florida, home of the biggest mosquitoes ever, except for maybe Australia where everything is bigger and badder. Anyway I was told to plant rose geranium around my home to repel mosquitoes. It worked so well that I made a spray of it to use when camping. Plus who doesn’t love the smell of it! Thanks and I”ll let you know how it works! So good to hear of your success with using rose geranium for mosquitoes, Dori! People often ask me if it helps to repel mosquitoes and I answer that it really seems to work for repelling mosquitoes and most other bugs for us, but I wasn’t sure if it was just a coincidence or not. So glad to hear another mosquito success story! Thank you for sharing. I hope you have the same success as I do with the ticks, too! Enjoy your new property! Hi Ethel, the rose geranium seems to repel fleas, too (most bugs seem to not like it). It won’t work well for an existing major flea infestation, though. So far I’ve not seen or heard any evidence stating that it would be harmful to use both the rose geranium and the flea collar at the same time. Take care! Hi Kelly, so glad to find your site. I have been using Young Living oils for years. My family has moved from. California to the east coast where the tick population is larger. Young living carries geranium (pelargonium gravelens) but not rose geranium. What is your recommendation? Thank you! Hi Ciri! Welcome to the East Coast 🙂 I’ve heard and read about the YL pelargonium gravelens also being quite effective for ticks. Do you know if YL carries the Bourbon variety, called Geranium Bourbon? That one is possibly the most similar to rose geranium in effectiveness for repelling ticks and is the one I would recommend trying if you can get it or aren’t noticing success with the YL Geranium. Take care and enjoy your summer! Hi there! I just wanted to let you know how much I’ve loved this bug spray. I was not able to get the rose geranium oil so I just purchased regular geranium essential oil and it has still worked like a charm all summer. We live in a very rural area where there are tons of deer and wood ticks. Haven’t found one on either of my kids or myself. Not one mosquito bite all summer either! Will definitely be using this FOREVER!!! I have ordered some rose geranium oil to make this tick spray. I am eager to give it a shot when I go trail biking. Last time I rode, I had four ticks on my leg! I don’t like using Deet, which clearly doesn’t work anyway. I hope it will also repel all the nasty biting flies that like to make a meal out of me. We have deer flies, black flies, mosquitoes, horseflies, and ticks. Do you know if the rose geranium will repel these as well? I ordered some Lemongrass oil to add to the spray to try to help repel the other nasties if the rose geranium doesn’t do the job alone. Hi Erika! We’ve had really nice success with the rose geranium repelling other insects, as well – especially mosquitoes. I hope you have the same success, too (and the lemongrass oil is a great idea!)! Hi Kelly, tick season is just getting ready to start here in New Hampshire. When you use the spray do you spray it all over the dog, or just the two spots where you’d put the drops of oil? I’m a little concerned about my dog licking it off his paws out legs. Hi Paul, I just spray on his back and one spray on his stomach where he can’t lick and that works just fine for us! Enjoy your beautiful New Hampshire summer! Has anyone had success with geranium oil vs rose geranium. Thank you! I’d love to learn this, too! I’ve heard of several people having fairly decent success with the Geranium Bourbon variety, but no one I know personally. Thank you, how big bottle do you use? It looks like 2oz? I don’t have a dog, but would like to make the spray for my son. He is 3 and a half. I am also wondering, can we mix lavender+lemongrass and geranium for both tick and bugs protection? i was looking online for rose geranium essential oil. some bottles i’ve seen say geranium essential oil. are they two different plants? My husband had 19 ticks on his body this spring. After we started using this spray, he has not had even one. It’s like a miracle. He already has Lyme disease, so he has a special hatred for these critters! doesn’t work for me,,used alot on my clothes from head to toe and still got ticks! I’m awaiting my ingredients for the flea powder. Can the rose geranium be used at the same time? I was delighted to find your recipe for a natural tick repellent for my dog. Especially as I had just moved to a wooded area in PA. I initially started using the Rose Geranium/Witch Hazel/Distilled water recipe in July of 2017 and was thrilled that I found no traces of ticks on my dog. Unfortunately, something has changed. It is now early Nov. of a warmer than usual fall and I am constantly finding ticks on my dog, at least one every 2 days if not more frequent. Using the same recipe and and spraying my dog daily the same as before, the results are far from satisfactory. I certainly cannot say what has changed, perhaps it has to do with the weather conditions, but I feel that a negative review should be included along with all of the positive. I still feel that Rose Geranium oil has the potential to work, and is certainly better than the possible side effects of a chemical collar and definitely far better than the topical treatments (which send my dog into a state of delirium for a full day when applied). However, I will be trying other recipes out there, including mixing with almond oil. I would be thrilled to hear of any other similar instances and changes people have made to their recipes for tick repellents for their dogs. Hi! Is this safe for children? I have a 4 year old 🙂 thank you!! I’m going to double check with my certified aromatherapist that I consult with, but I am fairly certain the answer is yes. Rose geranium is one of the safest and gentlest essential oils. I’ll report back after I hear back from her. Fortunately, being hairless, they are fairly easy to see. On the other hand, she is the exact color of the ticks, so it is hard to tell if it is a pimple or a tick. In 7 years, we’ve picked off only 3 ticks on long island. But they are getting worse here every year, so I really do want to do something to repel them. Oh, that is a bummer about your little hairless dog not liking rose geranium! 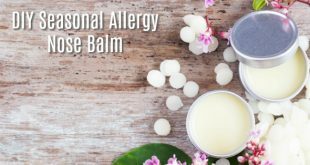 Other essential oils you could see if she tolerates that are also fairly decent at repelling ticks (but are especially great at repelling mosquitoes and flies!) are citronella or lemongrass. Hope you can find something! Thanks. She’s a weird one. She loves to come into our bed, but one night we put a little lavender oil in the bedding during a stressful time. She jumped onto the bed and right off again! 🙂 I’ve found Citronella does nothing for the mosquitoes. Just have to inspect her 3X a day – and if I want to be left alone, I’ll put some on myself! I’ve mixed it with an aloe & coconut oil massage oil. Where do you put the drops on yourself? I prefer drops rather than spray. 1 drop on my wrist, rub my wrists together and then rub my wrist behind my ears. Sometimes in the spring when ticks are especially bad, I’ll put an extra drop on my outer layer or shoes, too. i was wondering why you use distilled water instead of regular water. Hi Dawn, distilled water is generally recommended when making homemade recipes like this just because you can guarantee the purity (no bad bacteria). I often just use my regular filtered tap water, though – but I’m a bit of a rebel 🙂 Hope that helps! Hi there, your recipe says to use Vodka. Am I right in thinking the alcohol Vodka that’s on my bar? Haha, that is great about a fanny pack being called a bum bag…I’m calling it that from now on!! And yes, the alcohol that’s in your bar is what you use for this recipe.